Horst Schrader creates in silver and gold and has recently integrated semi-precious stone into his buckles and designs. His work always begins with the highest quality materials suitable for the application to insure durability and appearance and to give the longest lasting quality and value. Horst’s designs and quality are best known for their superior finishing and consistent quality. Buckle engineering is his specialty, which makes every piece an enduring and functioning object of jewelry that is uniquely beautiful, yet practical enough for everyday. 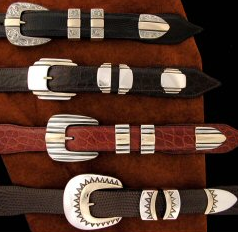 Desert Son of Santa Fe carries Horst Schrader belts and buckles. Contact our shop for inquiries on our current inventory.